What can you discover at "What's New at US Fall Foliage Vacations"
What's new in Poconos & New England Mountain Vacations? Simple to start or cancel - Anonymous - No e-mails - Can quickly view ONLY the new listings you want to see more about with automatic new updates - and you don't have to give out your name or e-mail address! keeps you current on other new additions or Tips about Affordable and Colorful US Fall Foliage Vacations - like a newly discovered Attraction Discount Tip or colorful scenic road trip - Kind of like a Site " Mini Journal "
-- click on the "What's an RSS Feed?" link here or above on left for Info. Once you subscribe to an RSS Blog, you will be amazed at how simple and time-saving it is. Really beats e-mail updates! You select to "read" only what new Info you are interested in from the brief headings. Tip - Looking for something specific on this page or a page with more Info on that topic? Hit <Ctrl> <F> on your keyboard and type the topic that you are looking for in the "Find" search box that appears. You will instantly see all instances of your search highlighted on this page. Notice we also have a Site Search Text Box at the bottom of most pages on this Site. Surprise your Honey with an Affordable Romantic Getaway Vacation for Christmas or New Years! A Surprise of a Romantic Getaway Escape is something you and your Honey BOTH will enjoy to begin the new year. Choose from Affordable Romantic Getaway Beaches, or Luxurious Hotel and Spa Getaways. Whatever Romantic Getaway Vacation you choose, It will be one of the most memorable and fun Gifts you both have ever received! See you at a Romantic Warm and Sunny Getaway Beach! - my Wife and I will be the grey haired couple watching the Ocean Sunrise. Continue reading "Surprise your Honey with an Affordable Romantic Getaway Vacation for Christmas or New Years!" Can also view the Peak Fall Foliage Color Maps so you can see the current status of the colorful Fall Foliage in the Pennsylvania Pocono Mountains. See you on a Colorful Pocono Mountains scenic Fall drive! Continue reading "Escape to a Colorful Fall Pennsylvania Poconos mini-Vacation Weekend or a Relaxing Fall Foliage Viewing Getaway Vacation"
Still considering a Colorful Fall Vacation Getaway to view some New England Fall Foliage Scenic White Mountain Attractions? There are many enjoyable attractions and beautiful scenic drives through the White Mountains near Mt Washington in New Hampshire. Check out Pictures, "Reviews," "Must See's" and Links for these and other New Hampshire White Mountains Area Attractions. Continue reading "Still considering a Colorful Fall Vacation Getaway to view some New England Fall Foliage Scenic White Mountain Attractions?" Find the Best Peak Foliage Color dates for a colorful Leaf Peeping Fall Foliage Viewing road trip. - Photo is a small sample version of a Northeast US Peak Fall Foliage Color Map. I'll be the guy pulled off taking Fall Foliage pictures with his Canon Camera on a monopod. Continue reading "Projected Peak Fall Foliage Color Maps to help plan the best date for your colorful Fall Foliage Vacation"
See Pictures and Info + return trip Option through the interesting Pennsylvania Dutch Country and Amish Farming area. 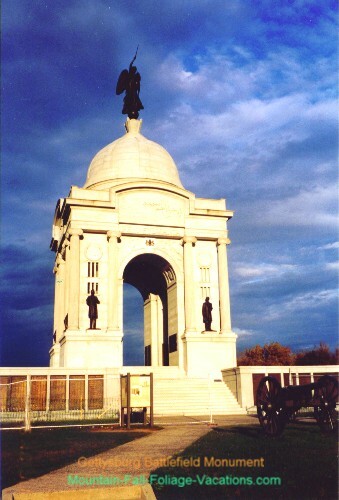 Continue reading "Check out a Fun and Educational Weekend Family Vacation to the Historic Gettysburg Battlefield"
The time for 2013 Colorful Pennsylvania Pocono Mountains Fall Foliage Viewing is almost here! Plan a Vacation Getaway to the southern Poconos near Lancaster, PA. You can combine this Scenic Road Trip with a night near the interesting Gettysburg Battlefield, or near educational Philadelphia Historic Independence Square Attractions. Don't miss out on a 2013 Fun & Affordable Poconos Fall Foliage Vacation! I'll be the guy pulled off taking colorful foliage pictures with my Wife patiently reading a Quilting Magazine in the car. Continue reading "Time to Plan a Colorful Fall Foliage Viewing Road Trip to the Pennsylvania Pocono Mountains"
Tour or Stay at the Historic Mount Washington Hotel Resort for your New Hampshire White Mountains Ski Trip or Upcoming Spring Vacation! 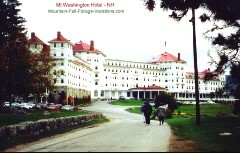 Check out a stay or a tour of the beautiful "Must See" Historic Mount Washington Hotel Resort while you are doing your Vacation to the beautiful New Hampshire White Mountains. Interesting self guided tours of the Historic Hotel & grounds are available. Also some great Skiing options and other Ski Resorts in the Area. If you are going in the Spring, try out a game on their 27 hole golf course! There are beautiful views of the nearby Presidential White Mountain Range from one of several huge "porches" or verandah at the Hotel. To more on the Historic Mount Washington Hotel Resort + Photos, Info Links, and other area Attractions. Continue reading "Tour or Stay at the Historic Mount Washington Hotel Resort for your New Hampshire White Mountains Ski Trip or Upcoming Spring Vacation!" Many enjoyable attractions and beautiful scenic drives through the White Mountains near Mt Washington in New Hampshire. 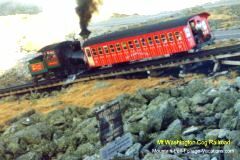 Ride the Historic steep Mt Washington Cog RR to the top. Tour Franconia Notch State Park + Tour the Beautiful and Historic Mt Washington Resort Hotel -- could even stay a night or two for the experience. Continue reading "Some Great things to See and Do for a Fall New Hampshire White Mountains Mt Washington Area Vacation"
Pennsylvania Camping and RV season is almost here! Time to start planning your Family Pennsylvania Pocono Campgrounds Vacation Fun in the PA Poconos Mountains. 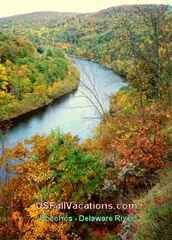 Check out the Interesting "Must See" Scenic Attractions and Scenic Day Trips in the Poconos Delaware Water Gap area. Don't miss these Fun & Affordable Poconos Vacations! Continue reading "Time to plan Fun and Affordable Poconos Camping Vacations in the Pennsylvania Pocono Mountains"
Time to think about planning a Affordable Getaway Weekend to a Beautiful New Hampshire Mt Washington Spring Getaway. 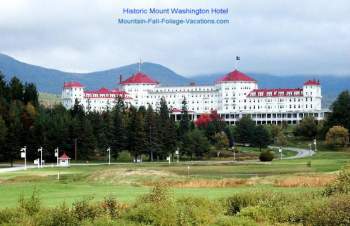 Check out the Majestic Historic Mt Washington Resort / Hotel and other "Top Pick" Getaway Vacation Resorts in the area, plus the many great NH White Mountains Attractions including the nearby Mt Washington Auto Drive Up to the top! Or, this listing of "Reviewed" White Mountains Resort Condo Rentals and Vacation Time Share Exchange options from Resorts in the New Hampshire White Mountains area. Gene Seecann -- I'll be the guy taking pictures of the beautiful mountain views! Continue reading "Plan your Relaxing and Affordable Mount Washington Getaway Vacation in the White Mountains of New Hampshire"
Continue reading "Users Best Fall Vacation "Raves," Rants, Top Picks & Stories"
Continue reading "The drive from Rangeley Maine to North Conway NH down Rt 16"
Continue reading "The Old Man of the Mountain"
Continue reading "Gettysburg Battle Picture Album & Historic Gettysburg Battlefield Pictures + Amish Buggy - Pennsylvania - Downloadable Pictures & Screensavers"
For your Summer Vacation - White Mountain Time Share Vacation Condo Rentals - Unused Time Share Week Deals. RCI and Interval International Top Ranked Vacation Resorts - with Amenities List & User "Reviews" + Tips. -- You do NOT have to be a Timeshare Owner to take advantage of these highly rated discounted Vacation Rentals. Continue reading "New Hampshire White Mountain Resort Top Picks - Discounted Vacation Condo Rentals"
Affordable Family Camping Vacations and Scenic Road Trips in the Poconos Mountains Delaware Water Gap Recreation Area. Interesting & Educational Pennsylvania Vacation attractions like the Gettysburg Battlefield nearby. Check out some beautiful Scenic Mountain Drives - Spring, Summer or Fall! Continue reading "Fun Family Camping on a budget in the Delaware Water Gap in Pennsylvania Pocono Mountains"
Continue reading "Contest Prize and Entry Info - Favorite Must See *Top Raves* + Best Mountain Vacations & Favorite Attractions"
Continue reading "Historic Gettysburg Battle + Gettysburg Battlefield Pictures, Pennsylvania - *Must See* Overnight & Day Trips - Reviews"
Continue reading "New Hampshire Mt Washington Hotel - Resort - *Must See* NH Historic Attraction"
Check out the great "Top Pick" deals available on Pennsylvania Weekend Getaways + Pocono Weekend Getaway Packages. Unwind with a Romantic Mountain Getaway Escape to a variety of Popular Vacation Destinations. Many options available to build your own Affordable Getaway Vacation. Continue reading "Escape to a Pennsylvania Weekend Getaway or an Affordable Pocono Romantic Mountain Getaway"
Check out the best weekend getaways to where its warm! Affordable romantic getaways in Florida and other warm & sunny destinations. Want good food and wine? - some inexpensive last-minute adult vacation getaway deals are available. Continue reading "Do a last-minute Getaway to where its Warm! - Affordable Weekend Vacation Getaways"
Some great choices are available for Weekend and Romantic Getaway Vacations in the New Hampshire White Mountains and other Romantic Mountain Vacation Destinations. Also "warm" Beach Getaway Vacations for the winter months or can check out some Ski Vacation Deals for those who want some action on the slopes. 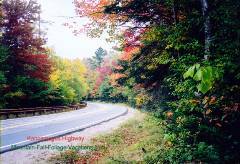 Continue reading "New England Romantic Getaways + Discounted Weekend Getaway Vacations"
Continue reading "Our Best New England Fall Vacation - Colorful Fall Drives on the Kancamagus highway"
See the Mountain Fall Foliage Colors here. New England White Mountains & Pennsylvania Poconos Autumn Foliage Picture Downloads + High Resolution Downloadable Picture Previews. Continue reading "Colorful Mountain Fall Foliage Picture Album + Screensaver Downloads"
Continue reading "Mount Washington Hotel - Our Favorite New Hampshire Historic Place"
Continue reading "Castle in the Clouds - Our Favorite Attraction on Lake Winnipesaukee"
Gettysburg Battlefield Trip - Our Family Loved It! Continue reading "Gettysburg Battlefield Trip - Our Family Loved It!" Continue reading "Time to plan a "leaf peeping" Getaway to see the fall Foliage Colors in the Pennsylvania Pocono Mountains"
New Hampshire White Mountains Fall Attraction Top Picks + Fun Day Trips & Colorful Fall Foliage Viewing Road Tours & Pictures - Check out a Scenic New England Fall Foliage Vacation this year! Continue reading "Time to think about a Colorful New England White Mountains Fall Foliage Vacation! - *Must See's* + area Attraction Tips"
Checking out the Great Gettysburg Battleground Attractions and need to find a good Restaurant in Gettysburg with no "surprises?" See our "Top Pick" Gettysburg Pennsylvania Restaurant List with Lunch and Dinner Dining "Reviews" & Tips. Even "Locals" recommendations & Ice Cream Dessert Spot Tips. Continue reading "Gettysburg Pennsylvania Restaurant Top Picks - Our Favorites + "Reviews" & Tips"
Continue reading "Gettysburg Battle - *Must See* Historic Gettysburg Battlefield Pennsylvania Attraction"
Continue reading "Historic New Hampshire Mt Washington Hotel / Resort - A * Must See * Attraction"
Continue reading "Peak Color Fall Foliage Maps - New England + Poconos Mountains - NH - PA - Maine"
Continue reading "Pennsylvania Fall Vacations - Gettysburg Historic Battlefield Attraction"
New Hampshire White Mountains Fall Attraction "Reviews" + Day Trips, & Colorful Fall Foliage Viewing Road Trips & Pictures - Check out a New England Fall Foliage Vacation this year! Continue reading "New England Fall Foliage *Must See's* + Scenic Attractions & Pictures"
Historic Gettysburg Battle Picture Album and Battlefield Pictures + Gettysburg Cemetery, & Amish Buggy - horse drawn with turning lights pictures / desktop wallpapers / downloadable screensavers. Has link to free Previews of selected high resolution downloadable Photos from both of our US Vacation Sites. New England Fall Foliage Picture Album - Screensavers / Wallpapers page - approximately 5 x 7 size free downloadable and printable versions of most pictures on this page + some other favorites. Can now do Previews of selected high resolution downloadable Photos from both of our US Vacation Sites. Please send us any Comments or Suggestions you might have for this Fall Foliage Vacations Blog or Site to us on our Comments, Suggestion, & Favorites Form. If you have any personal New England Fall Foliage Vacation or Attraction Favorites -- with or without colorful Fall Foliage Pictures -- you would like to share, please send them using our Comments & Fall Vacation Favorites Form above. To top of this page - Affordable Mountain US Fall Foliage Vacations Blog / RSS Feed - What's New at Colorful New England Fall Foliage Vacations Including New Hampshire + New England Attraction Reviews & Scenic Pennsylvania Pocono Mountain Vacations and area Attractions.